Meteor House » An All-New Dayworld Novel! 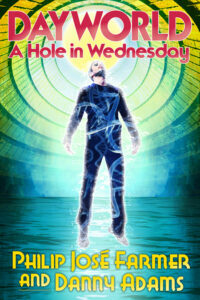 Philip José Farmer’s Dayworld trilogy, as well as his short story “The Sliced-Crosswise Only-On-Tuesday World,” imagines a severely overcrowded future that cures the overpopulation problem by “stoning” six-sevenths of the population each day. Farmer began a prequel Dayworld novel, A Hole in Wednesday, but did not complete it, and Meteor House is pleased that Danny Adams has picked up the mantle. Set some time before the events in the original trilogy, the novel nonetheless has direct links to the acclaimed series, exploring the developing world and antecedent characters who vigorously challenge the life in which they find themselves trapped. The Dayworld was born from the overpopulation and chaos of the late 21st century: live just one day out of seven, spend the rest in a suspended animation called stoning, and humanity will only need one-seventh of the resources it was consuming on its dying planet. Now, three-and-a-half centuries into this New Era—or two “subjective generations” later—everyone seems blessed with peace and abundance. But one man is about to discover that the seeds of the world’s destruction were deeply planted by the time the Dayworld began. As with most Meteor House titles, the print run of the Signed (by Danny Adams) Hardcover Limited Edition will be determined by the number of books preordered. And while the trade paperback is not a limited edition, preordered copies will also by signed by coauthor Danny Adams. To ensure you get a signed copy of either edition, but sure to order no later than June 15th, 2016. 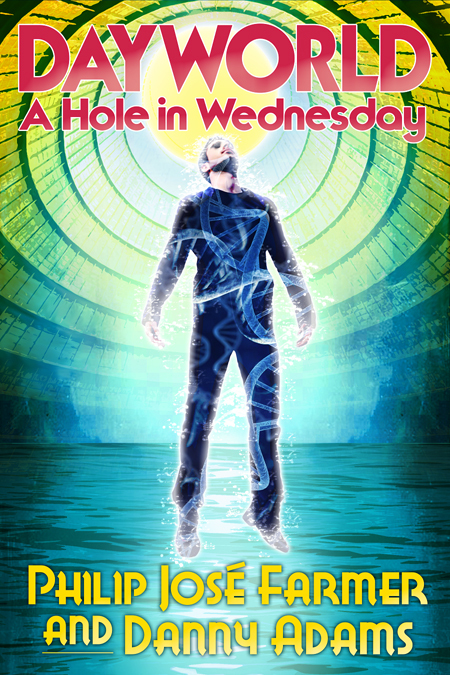 A Hole in Wednesday will debut at PulpFest 2016/FarmerCon XI, July 21-24 2016, in Columbus, OH, where Mr. Adams will be available for interviews and podcasts. SPECIAL OFFER: Purchase both the paperback and hardcover together and save $5 off the cover price and even more with combined shipping! US customers save $8, Canadian customers save $11, all other customers save $18 total! When preordering below, make sure you choose the correct button and hit the down arrow to select the correct shipping option. Philip José Farmer was named a Grand Master by the Science Fiction and Fantasy Writers of America in 2001, capping a distinguished career of over fifty novels and one hundred short stories, many of which were award winners. He is best known for his Riverworld and World of Tiers series, and for the Wold Newton Family, which includes many recognizable characters such as Tarzan, Doc Savage, Nero Wolfe, and Sherlock Holmes. Danny Adams is the author of the early medieval historical novel Lest Camelot Fall (Musa, 2014) and coauthor, again with Philip José Farmer, of the short science fiction novel The City Beyond Play (PS Publishing, 2007/2012). Adams has also been published in Abyss & Apex, Asimov’s Science Fiction, Ideomancer, Mythic Delirium, Not One of Us, Paradox, Space & Time, Star*Line, Strange Horizons, and The Worlds of Philip José Farmer. He also reviews science fiction and fantasy books for Publishers Weekly.